How on earth do we find ourselves hanging off a cliff-face, in a glass-bubble bedroom, suspended on wires above Peru’s Sacred Valley? 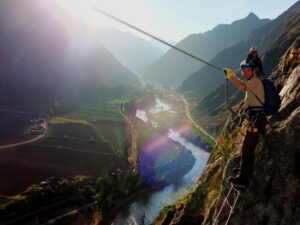 Well, it is just the small matter of a 400m rock-climb via-ferrata and a 200m high hanging wire-bridge to reach said bubble, then a six-stage zip-wire descent to return to terra-firma next morning. Stupid or brave… ?